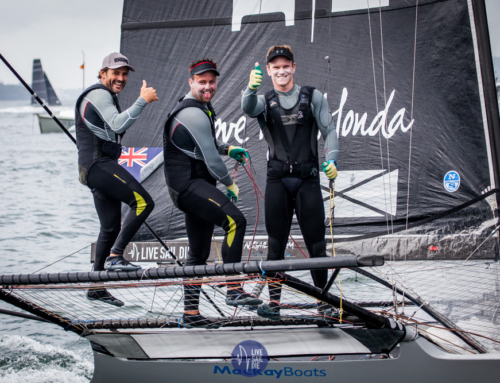 Defending 18′ Skiff ANZAC Champions Thurlow Fisher Lawyers (AUS) have accepted the challenge from Kiwi rivals Yamaha and it’s game on the 2016 Maersk Line 18′ Skiff ANZAC Championship. “We are excited to be here and to sail somewhere different other than Sydney Harbour,” said skipper Michael Coxon on his way to start rigging the boat. “We always have a fun time here, it’s different tide and the conditions are tough, but our biggest puzzle is understanding the Kiwi courses! “It’s great to get wet again. The team have some new booties and we are keen to test them out. “Yamaha are on fire at the moment but we reckon we’ve got them for this regatta. Challenge accepted and here’s hoping we can beat them on their home waters. But they are quick and are sailing really well. We haven’t done anything since the JJ’s though!” continued Coxon. The 2016 Maersk Line 18′ Skiff ANZAC Championship is hosted by the Auckland Skiff League at their new home, Royal Akarana Yacht Club. Racing got underway on time this afternoon with two harbour races kicking things off. 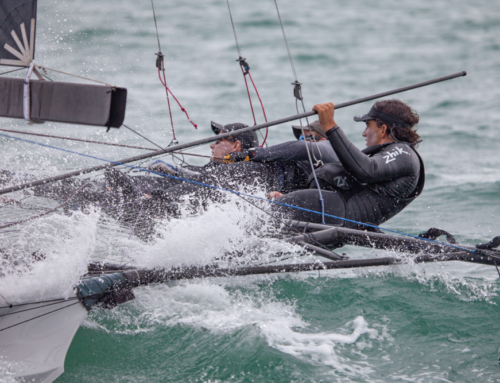 2015 18′ Skiff AUS Championship.